The northbound lanes of a major stretch of the George Washington Parkway in Virginia will remain closed through the weekend as road crews and engineers assess a large sinkhole that opened up underneath the road following heavy rain Thursday night. 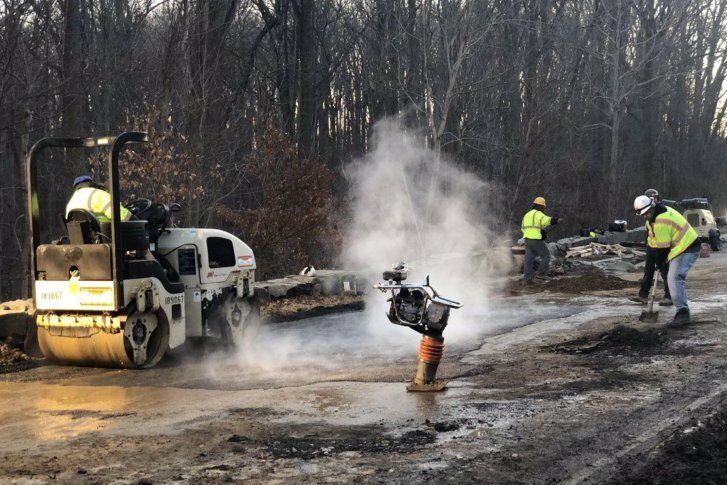 The northbound lanes of a major stretch of the George Washington Parkway in Virginia will remain closed through the weekend, though officials from the National Park Service say repairs are going well and hope to have the road open for some traffic by Monday. Road crews and engineers are working to assess and repair a large sinkhole that opened up underneath the road following heavy rain Thursday night, the National Park Service said. The closures affect all of the northbound lanes of the parkway between the Capital Beltway and Virginia Route 123. “As a critical link in the region’s transportation network, closing the George Washington Memorial Park is never a decision that is made lightly,” the Park Service said in a statement. The Park Service said the sinkhole, which caused a minor car crash early Friday morning, was likely caused by a damaged stormwater drain pipe. Preliminary findings indicate the sinkhole is about 10 feet deep, 12 feet wide and 30 feet long — or roughly the size of a city bus. The Park Service had initially closed the entire stretch of the parkway for several hours early Friday morning, but the southbound lanes reopened by 11 a.m. The total closure of the heavily traveled 25-mile long commuter route caused massive backups on the Beltway and roads into D.C. Friday morning. The Park Service said the sinkhole opened up in the northbound lanes of the parkway near Dead Run. A driver traveling in the right lane of the northbound section of the parkway just before 6 a.m. Friday hit the sinkhole along the road, lost control and hit a stone wall. The driver was not injured, but first responders determined there was an active sinkhole at the site. The Park Service said the sinkhole appeared to be caused by a damaged concrete stormwater drainage pipe below the ground. The Federal Highway Administration was called in to assess the extent of the sinkhole, and crews worked throughout the day to excavate around the pipe to determine the best way to safely and effectively fill the void. The Park Service is still examining how Thursday’s heavy rain may have played a role in the sinkhole this morning. Sinkholes are often preceded by heavy rain, officials said. In the meantime, the closure is putting more traffic on Canal Road and the Clara Barton Parkway, Dildine said. Major delays are likely on these roads and on many several other alternate routes through Bethesda, Maryland, and McLean, Virginia. The closure is also a big test for Interstate 66 inside the Beltway. “There will be a great demand on the westbound lanes, which are tolled from 3 p.m. to 7 p.m. Tolls could be much higher than usual,” Dildine said. As of noon, tolls are scheduled to remain in effect. VDOT will reassess later. The WTOP Traffic Center began getting calls about road damage on the George Washington Parkway late Thursday night as heaviest rain began tapering off. In the dark and wet conditions, listeners initially had trouble identifying the extent of the damage. A better indication of the extent of the road damage came early Friday morning. “As the sun started to come up, we could see a large hole and workers putting a measuring tape down,” said NBC Washington helicopter photographer and reporter Brad Freitas told WTOP. “It appeared to be much deeper than we originally saw before the sun came up,” he said. “It really looked terrible once we were able to get some light on it. There could be some erosion leading to compromised road conditions there,” he said. This incident is reminiscent of the sinkhole that formed on the parkway near Windy Run in December 2014. That emergency closure lasted through two rush hours and caused significant delays on both sides of the Potomac River. Drivers first encountered the sinkhole during the heavy rain Thursday night, which broke records through the region. The rains set an unofficial record at Dulles International Airport with 2.69 inches. The previous record occurred in 2000 when 1.29 inches of rain fell. At Reagan National Airport, 1.96 inches fell, but that did not break the record set in 1918 when 2.15 inches fell. At Baltimore-Washington Airport, a record was nearly set. The airport saw 1.74 inches Thursday. The record, set in 2000, is 1.77 inches. WTOP’s Dave Dildine, John Domen, Steve Dresner and Nick Iannelli contributed to this report.